Husky 1/2 in. drive sockets are manufactured from chrome-vanadium steel and heat treated for added strength and wear protection; providing durability for a lifetime of hard use. Each socket features chamfered lead ins for quick and easy placement onto fasteners every time. Their polished chrome finish resist rust and corrosion and easily wipes clean of oil and dirt. The sockets in this 18 piece 1/2" drive 6 point metric deep chrome socket set feature outstanding corrosion resistance as a result of our proprietary in-house plating process. In addition, Gray sockets are made from premium tool steel for maximum durability and feature a distinct brilliant jewellery-like finish. Made in Canada and backed by Gray Tools worry-free lifetime warranty. Husky 1/2 in. drive Impact Sockets are manufactured from chrome molybdenum alloy steel and designed to withstand rigors of heavy duty use. Size markings have been hard stamped into the sockets for quick and easy identification that will never wear away. Each socket features chamfered lead-ins on both ends allowing for easy attachment to drive tools and placement onto fasteners. Husky 1/4 in. drive sockets are manufactured from chrome-vanadium steel and heat treated for added strength and wear protection; providing durability for a lifetime of hard use. Each socket features chamfered lead ins for quick and easy placement onto fasteners every time. Their polished chrome finish resist rust and corrosion and easily wipes clean of oil and dirt. Husky 3/8 in. drive sockets are manufactured from chrome-vanadium steel and heat treated for added strength and wear protection; providing durability for a lifetime of hard use. Each socket features chamfered lead ins for quick and easy placement onto fasteners every time. Their polished chrome finish resist rust and corrosion and easily wipes clean of oil and dirt. 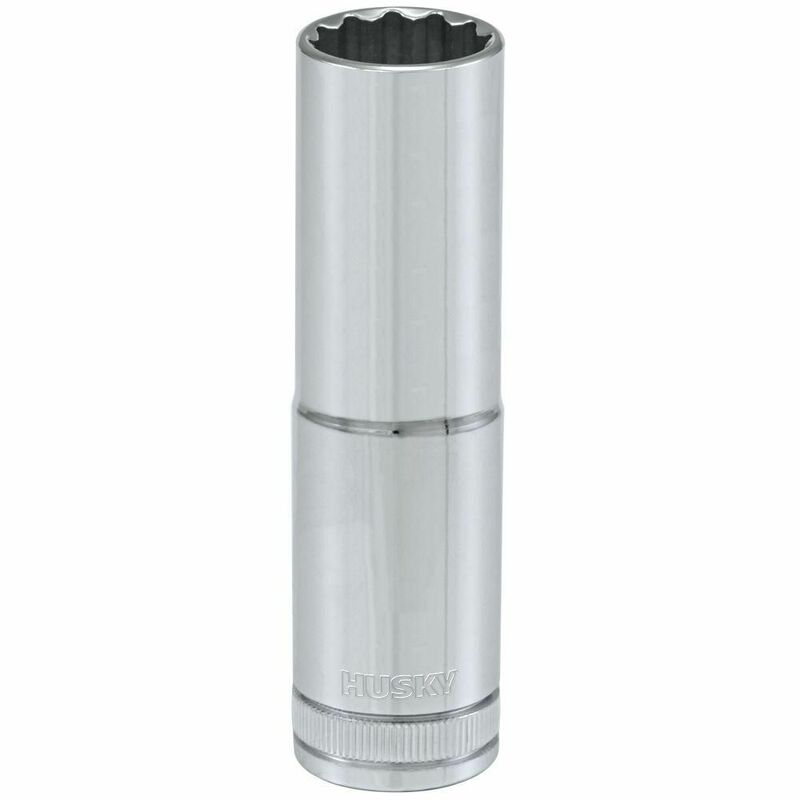 1/2 Inch Drive 14mm 12-Point Metric Deep Socket Husky 1/2 in. drive sockets are manufactured from chrome-vanadium steel and heat treated for added strength and wear protection; providing durability for a lifetime of hard use. Each socket features chamfered lead ins for quick and easy placement onto fasteners every time. Their polished chrome finish resist rust and corrosion and easily wipes clean of oil and dirt.